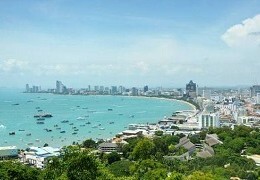 Pattaya is conveniently located in Chonburi province at the Eastern seaboard of the Gulf of Thailand, approx. 140 kilometers southeast of Bangkok and just a 90-minute drive from the Suvarnabhumi Airport. Thanks to ambitious road construction over the last decades, the motorway connection between Bangkok and Pattaya has constantly improved, so that now it’s a mere two-hour drive between both cities. Pattaya’s central location near Bangkok and the kingdom’s main international airport, from where several regional budget airlines offer inexpensive domestic and international flights, also makes the seaside resort a perfect hub for tourists who enjoy traveling around Thailand and other parts of Southeast Asia. The 2006 opening of Bangkok’s new international Suvarnabhumi Airport (speak suwanna-poom), which replaced the old Don Mueang Airport in Bangkok’s North, has made it even easier and faster to get to Pattaya. Located just south of Bangkok in Samut Prakan province, it’s usually just a 90-minute bus or taxi ride from Suvarnabhumi airport to Pattaya. Taxis depart from airport level one and mostly charge a flat rate of around 1,300 Baht, i.e. unless you opt for an expensive “limousine” service which may easily cost you a few thousand Baht. An air-conditioned taxi ride is certainly most convenient after an exhausting long-haul flight. 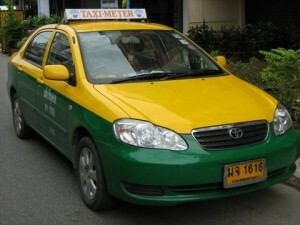 As with most taxis in Thailand, passengers will however have to negotiate a price with the driver first (which also applies to “pseudo-taxi meters” at the airport.) In general, anything between 1,000 and 1,800 Baht should be enough to get you to Pattaya, though. Public bus service from Suvarnabhumi to Pattaya or Jomtien is provided from the bus terminal at the airport’s so-called Transportation Center on Level One. After you have taken the escalator down from Level Two to Level One, turn left and walk straight on to gate no. 8 where the counters for buses to Pattaya are located. Please note that fares and departure times may change frequently. 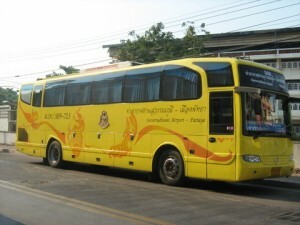 Airport-Pattaya Bus (389 Bus, Roong Reuang Co. Ltd.) provides direct transfer from Suvarnabhumi Airport to Jomtien and vice versa, with only 32 seats in each coach and an estimated travel time of approx. two hours. The company’s Jomtien office is located outside the Foodmart supermarket on Thappraya Road (opp. Pan Pan restaurant, just around the corner from Thepprasit Road). The departure location at Suvarnabhumi Airport is on the 1st floor of the arrivals terminal (between gates 7 and 8). Departure times are 7h, 8h, 9h, 10h, 11h, 12h, 13h, 14h, 15h, 16h, 17h, 18h, 19h, 20h, (21h), (22h). The one-way fare is 120 Baht (April 2016). Bell Travel Service operates a private bus service between Suvarnabhumi Airport and Pattaya’s bus terminal on North Pattaya Road. They also provide a “door to door service” straight from the arrival hall to your hotel room; upon arrival at the North Pattaya bus station, passengers will be transferred to minivans that will take them to their respective hotels in Pattaya. Bell Travel Service have an office at the bus terminal on North Pattaya Road (Sukhumvit road end) from where coaches go directly to the airport’s departure terminal. Pick-up service from your hotel in Pattaya to the bus terminal is also available and included in the price of 250 Baht per person. Departure times are 6h, 9h, 11h, 13h, 15h, 17h, 19h. From November 2014, bus service to Don Mueang Airport is also available at 400 Baht/person. Airport-Pattaya Bus (Roong Reuang Coach Co. Ltd.) offers direct transfer from Pattaya/Jomtien straight to Suvarnabhumi Airport (departure terminal on the 4th floor) at 120 Baht/person. With only 32 seats in each bus, the estimated travel time to is two hours. Their departure location and ticket office is located outside the Foodmart supermarket on Thapphraya Road in Jomtien (opposite the Pan Pan restaurant, north of the junction with Thepprasit Road). Departure times (Foodmart office) are 7h, 8h, 9h, 10h, 11h, 12h, 13h, 14h, 15h, 16h, 17h, 18h, 19h, 20h, 21h. More comfortable limousine taxis can be booked in most hotels and travel agencies, with fares starting at around 1,500 Baht. Bangkok’s old Don Mueang Airport on the capital’s northern outskirts is a hub for domestic and regional flights and used mainly by low-cost airlines like Nok Air and Thai Air Asia. Since November 2014, Bell Travel Service also operate a bus service to Don Mueang Airport at 400 Baht/person. The former U-Tapao military airport in Sattahip is even closer to Pattaya (approx. 30-minute driving distance) but is used by only few international airlines so far and serves mainly Russian charter flights. 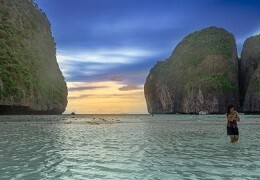 Bangkok Airways operate domestic flights to Koh Samui and Phuket from here. If you travel from Bangkok’s city centre or the Sukhumvit Road area and want to avoid an expensive taxi ride, your best option for getting to Pattaya is to catch a public bus from the Ekamai bus terminal on Sukhumvit Road (immediate skytrain access). Air-conditioned coaches to Pattaya depart every 30-40 minutes from around 5 a.m. the morning until late at night. One-way tickets cost approx. 130 Baht. The bus ride to Pattaya shouldn’t take longer than two hours; however, do make sure you catch a coach that takes the motorway route straight to Pattaya (not the Sukhumvit Road route via Chonburi). If you stay in Bangkok’s North you can also travel from the Morchit bus terminal on the northern outskirts of the capital. Coaches to Pattaya depart every 30-40 minutes from around 4.30 a.m. till 10 p.m. The one-way fare is approx. 130 Baht, same as when traveling from Ekamai. Buses operated by Roong Reuang Coach Co. Ltd. (PattayaBus.com), Pattaya’s largest air-con bus company traveling between Bangkok and Pattaya, will drop you off at the main bus terminal at the Sukhumvit Road end of North Pattaya Road, where you can continue your journey with a Baht-Bus taxi; other buses may drop you off anywhere along Sukhumvit Road. If you haven’t yet booked a room in Pattaya by then, online booking sites like Agoda.com have discount internet rates for more than 1,000 hotels, resorts and guesthouse all over Pattaya. There is also a growing number of minivan services to Pattaya, mostly based in the vicinity of Bangkok’s Victory Monument. Fares start at around 100 Baht a person, with minivans departing as frequently as every 15 minutes. PattayaVan, part of Roong Reuang Coach Co. Ltd., is one of the most reputable companies providing minivan services between Bangkok and Pattaya. From 6 a.m. to 8 a.m., their vans depart from Bangkok every 15 minutes. The one-way fare is only 97 Baht (January 2015). 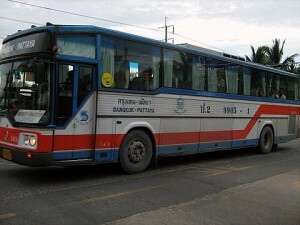 Air-con coaches from the bus terminal on North Pattaya Road to Bangkok’s three main bus terminals – with frequent connections to virtually all provinces of the country – depart regularly every 30-40 minutes. One-way fares are approx. 130 Baht. 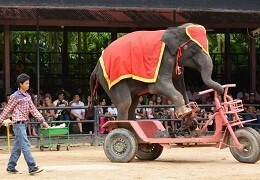 For more details, routes and timetables, please see their official website PattayaBus.com. Minivans to Bangkok (Victory Monument) depart from several locations around Pattaya, e.g., the Petronas gas station on Sukhumvit Road (Central Pattaya), Bali Hai Pier (southern end of Walking Street), or from near the traffic lights at the intersection of South Pattaya Road and Second Road/. Fares approximate 100 Baht per person, with minivans departing as frequently as every 15 minutes. PattayaVan, part of Roong Reuang Coach Co. Ltd., is one of the more reputable companies providing minivan services to Bangkok. 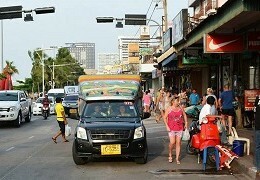 From 6 a.m to 8 p.m., their vans depart every 15 minutes from several boarding locations in Pattaya. The fare is 97 Baht (January 2015). For more details, boarding locations etc. please view their website. Minivans from Jomtien to Bangkok depart every full hour from outside the Family Mart at the corner of Jomtien Beach Road and Soi 5 (fare 150 Baht). A VIP bus straight from Pattaya to Phuket leaves every night at 6 p.m. from the “777 bus” station on Pattaya Third Road (North Pattaya Road end). With only one departure per day, advance booking is highly recommended. Yes, you can travel from Bangkok to Pattaya by train, i.e. if you’re a die-hard railway fanatic and don’t mind a journey of four hours and more to cover a distance that would take a taxi or bus just two hours or less. There is one daily connection between Bangkok’s Hua Lamphong railway station (with MRT subway access) and Pattaya’s little railway station off Soi Siam Country Club (on the so-called “dark side” off Sukhumvit Road). The scheduled departure time from Bangkok is 6.55h; the scheduled arrival time in Pattaya is 10.35h. Trains from Pattaya leave at 14.21h and are scheduled to arrive in Bangkok at 18.25h. The one-way fare is 31 Baht (only 3rd class available). While that’s obviously as cheap as it can get, we assume that, due to the length of this rather unpleasant journey, this alternative will be of interest only for die-hard railway fanatics; especially given that once you arrive in Pattaya, it’ll be hard to catch a taxi or so from a station that isn’t just slightly out of the way but also hardly used by Thai people. If you travel from Bangkok to Pattaya by car, you should expect a ride of approx. two hours, or about 90 minutes from Suvarnabhumi Airport, depending on the traffic situation. The most convenient route when driving from Bangkok is to first follow the Bang Na-Trat highway (No. 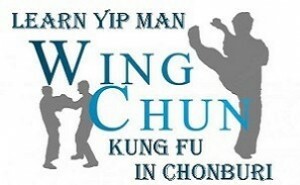 3) via Bang Pakong to Chonburi, and then change to the the new Chonburi-Pattaya-Rayong highway (No. 7). A lot of traffic can be avoided by opting straight for the Chonburi-Pattaya-Rayong highway. For a listing of car rental companies based in Pattaya, please visit our Get Around in Pattaya page. Speak German? Wenn Ihr mehr zum Thema Anreise nach Pattaya erfahren möchtet, und wie man aus Bangkok oder vom Suvarnabhumi Flughafen am besten, schnellsten und günstigsten nach Pattaya kommt, schaut doch einfach mal auf unserer neuen deutschsprachigen Pattaya Info-Seite vorbei! 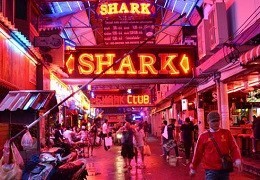 6 Responses to How to Get to Pattaya? Is there a bus that goes from Suvarnambhum airport to Jomitien bus station? Yep, the blue-white Airport-Pattaya bus (no. 389). Their Jomtien office and arrival/departure location is at the Foodmart supermarket on Thappraya Road, near the junction with Thepprasit Road. Here’s their website: http://www.airportpattayabus.com. Hi my arrival in suvarnabhumi airport is around 12midnight, I have plan to go to Pattaya right away is there any bus scheduled in the midnight to pattaya? Sorry, no more buses at that time. You will need a taxi to get to Pattaya. Hi. Would it be safe to catch a taxi at that late night timing? I am landing at similar timings in December 2016. We are a young couple and I am concerned about safety on route to Pattaya. Not just the risk of the taxi driver, but also any elements en route on the road. So if you can advise, I would be pleased. Thanks.